As a parent, you may wonder which are the best baby toys for your little miracle. 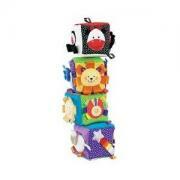 Not only can the best baby toys be entertaining; they can also help your infant grow and develop. So, what makes a toy the best? It should be visually appealing for your child, safe for infants to manipulate and chew, and it should offer some physical or mental excitement for your baby. 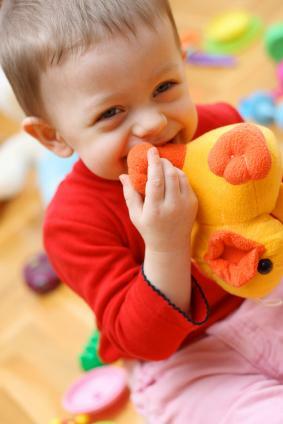 Look for toys with a variety of textures, shapes and actions or sounds to keep your baby interested. Your baby will start by holding a single block and maybe chewing on it. Soon, he will enjoy knocking over simple towers you build. Then, baby will progress to building towers of his own. If you get nesting sets of blocks, they can also be placed one inside another, helping to teach your baby even more about spatial relationships. Try these soft stacking blocks, soft nesting blocks, or these sturdy wooden alphabet blocks. Plush toys with sounds and textures. These are mainstays for babies and can be taken in the car and stroller easily. Several manufacturers make some very compelling and appealing plush manipulative toys that are definitely among the best baby toys. Lamaze has several including Larry the Lion that are nice to the touch and have crinkling, jingling, squeaking and rattling parts. Also look for Lamaze's "My First Fish Bowl" for a fun manipulative to teach the concepts of in and out. The Baby Whoozit from Manhattan Toy Company is great, too! As your baby gets her teeth, she is probably going to have some discomfort. Gnawing on a good teething toy can help out with the pain as well as being fun. Look for heavy textured teethers, or one of the newest types - massaging teethers. When baby bites down, these vibrate in a soothing fashion. Playmats and gyminis provide entertainment for your baby whether she is laying on her back or spending some time on her tummy. Look for mats with attractive pictures, soft fabric, and exciting flaps, tags, and other things for baby to inspect and explore while she is working those neck, shoulder, and upper body muscles. Infant gyms dangle toys over baby (with plastic links - never with long strings or cord) so baby can watch, grab and reach. It is never too soon to read to your baby and well-made books for infants can be toys, too. Look for sturdy board books, fabric books and bathtub books. Some will even have textures to touch and feel, characters and parts that attach and can be tucked in special pockets, and other fun features. Whether it is a standalone activity center, part of a bouncy seat or attaches to a stroller, activity centers allow babies to try a lot of different actions. There is no doubt as to why toy keys and phones are some of the best toys for babies; they know how important these objects are to us grownups! If you choose keyrings or phones with electronic sounds, make sure they are not too irritating since you are sure to hear them thousands of times a day! Some toy phones even allow you to record a personal message for baby.